This past weekend, we celebrated my mother’s 80th birthday with a Korean feast! I made several of our family favorites, such as galbijjim, bossam, japchae, nokdujeon, ojingeo muchim, saengseon jjim (steamed fish), and gujeolpan (platter of 9 delicacies). Most of these dishes are what she used to make for us on special occasions. My mother greatly enjoyed the food and family gathering! This shrimp dish, called kkanpung saeu (깐풍새우), is another dish I prepared. 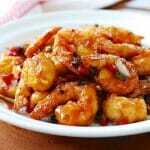 It’s a deep-fried shrimp dish glazed in a sweet and spicy sauce. I hope to share the other recipes from the celebration that aren’t on the blog soon! Like tangsuyuk, kkanpung saeu is a popular Korean-Chinese dish, which is a Chinese dish that’s adapted for the Korean palate by Chinese immigrants in Korea. 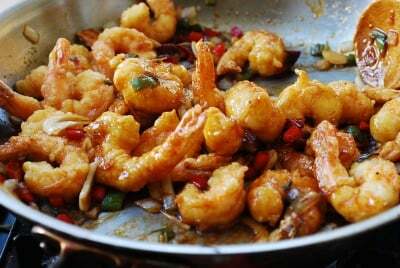 Kkanpung is a Korean pronunciation of the Chinese word that refers to stir-frying until the sauce is all absorbed, and saeu (also spelled saewu or saewoo) means shrimp in Korean. 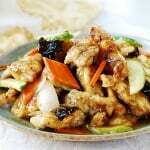 When the dish is made with chicken, it’s called kkanpunggi (gi meaning chicken in Chinese). 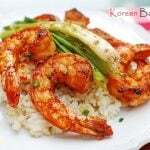 You can use this kkanpung shrimp recipe to make the chicken version as well. 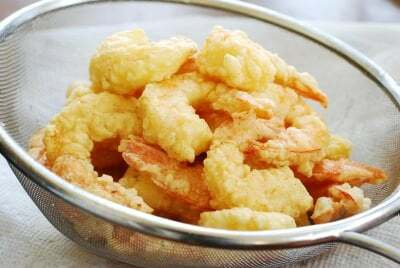 Kkanpung dishes are typically served as appetizers to share at Korean-Chinese restaurants before eating jajangmyeon or jjambbong as a main dish. It can be pricey, but it’s easy to pull together at home! 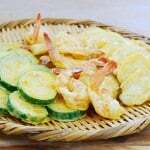 To make the batter, I simply mix the shrimp with some potato starch and egg until the shrimp is evenly coated. This creates a light yet crispy coating. 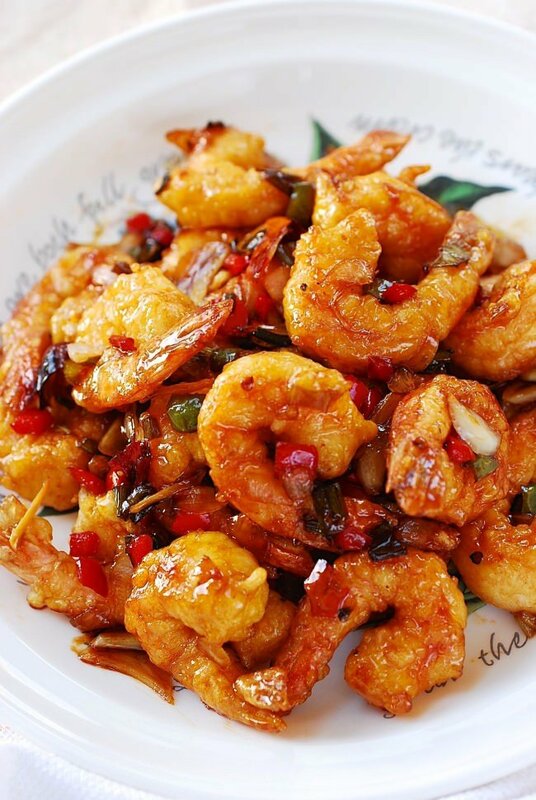 Be sure to deep-fry the shrimp twice for extra crispiness that will stand up to the sauce. For a spicy kick, I used dried hot peppers to make chili infused oil, but you can use commercially prepared chili oil and/or fresh green/red hot peppers instead. You can always leave them out if you don’t want any spiciness. 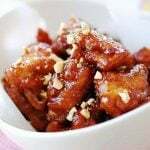 A Korean-Chinese deep fried shrimp glazed in a sweet, slightly sour and spicy sauce. 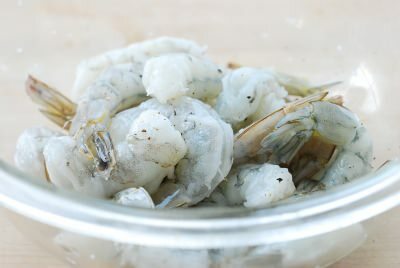 Clean the shrimp, drain, and pat dry with paper towels. Lightly sprinkle with salt and pepper. Let it sit until ready to coat with the batter. 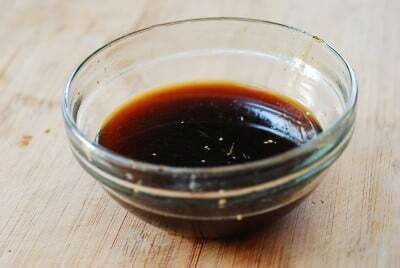 In a small bowl, mix all the sauce ingredients, except the sesame oil, well until the sugar is dissolved. Add the starch and egg to the bowl with the shrimp. 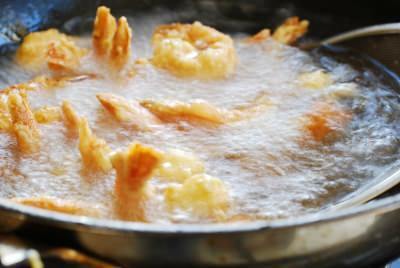 Mix everything well by hand until there's no visible starch powder and the shrimp is evenly coated with the batter. 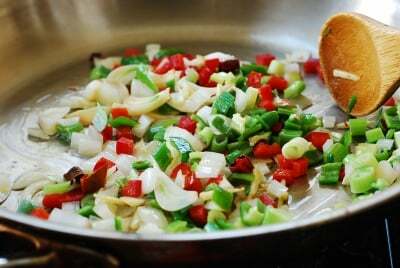 Add 4 cups of oil to a deep fryer, wok, or large pot. 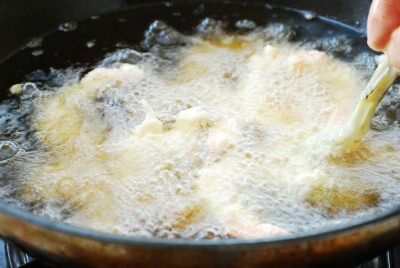 Heat over high heat to 340°F or until a drop of batter in the oil moderately bubbles up to the surface. 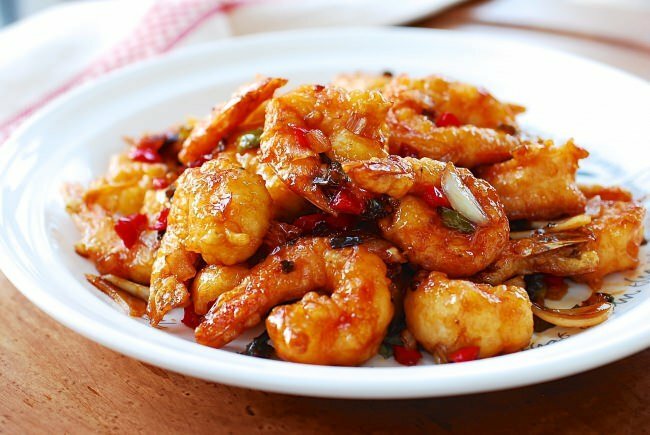 Using metal tongs or chopsticks, drop the shrimp in the oil one at a time, in two batches. Cook until lightly golden, about a minute. 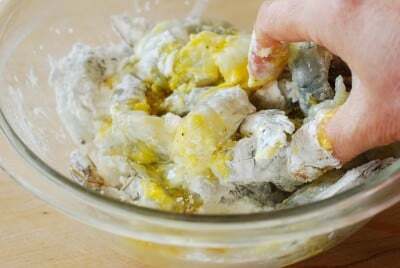 Remove them quickly with a wire skimmer or a slotted spoon. Drain on a wire rack or in a large mesh strainer set on a bowl. Reheat the oil to 340°F between the batches and for the second frying. Add the shrimp (you can do this in one batch for the second frying) and briefly deep fry again until lightly golden brown. Drain on a wire rack or in a large mesh strainer. 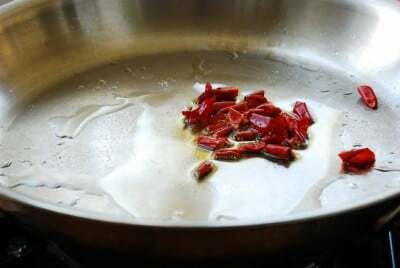 In a large pan or wok, add the dried pepper and 3 tablespoons of deep-frying oil over low heat until the oil starts to turn red. This only takes a few seconds. Do not burn the peppers. Turn up the heat to high. 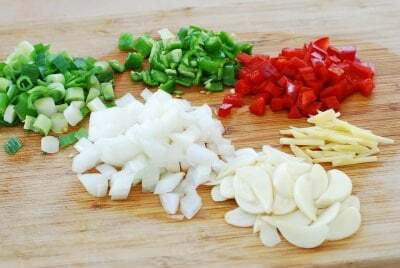 Add the garlic, ginger, onion, and scallion, and stir fry briefly until fragrant. 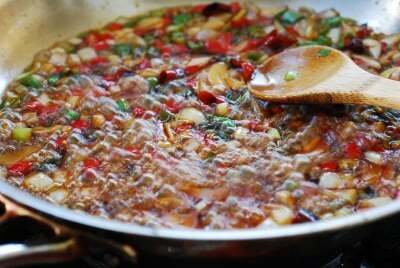 Stir in the green chili pepper and red bell (or chili) pepper, and cook for an additional minute or two. Add the sauce, and boil for a couple of minutes until the sauce is slightly thickened, about 2 minutes. 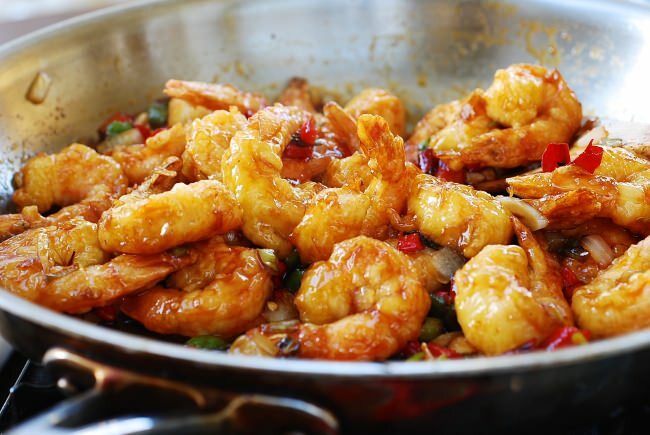 Drop the shrimp into the pan, and quickly stir everything together until the sauce is almost absorbed. Drizzle the sesame oil, and toss everything together again. Serve immediately. This looks great! And I’m so glad to have discovered your blog. Delicious looking food and love your step by step photos! Welcome to Korean Bapsang, Kero! And thank you for the nice words. Hope you find many dishes to try. Made his today . Was really good , my husband said I need to make it every week . Can use rice to white wine ..?? The rice need to be in minced form ?? Great Post.Thanks For sharing this post. This is a terrific site with great recipes. I’m a big fan! Thank you so much for being a big fan! I really appreciate it. 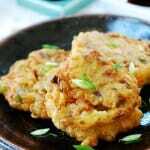 I love Korean food…and I am going to make this dish! This is like my dream! Hope you try it soon! 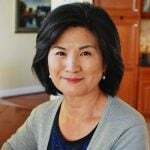 My husband is Korean born he came to the U.S when he was 5. Your recipes and food prep techniques are a God send and a staple in our home. I’m grateful to you for sharing your Korean food culture with the world … so delicious! You have enriched our lives and our dinner plates immensely. We thank you! Hi! I'm Hyosun, and I am a Korean-American mom of two wonderful grown-up children. 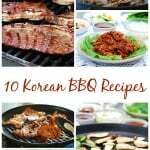 Here, you will learn how to cook Korean dishes the way we Koreans traditionally eat at home.